Vicky Laing and her mount Gifted Leader made every post a winning one when landing the St Patrick's Derby by two and a half lengths at Cheltenham this afternoon. The Ian Williams-trained nine-year-old was sent off in front at the beginning of the race and never saw another rival as his jockey set a perfect pace and always had enough in reserve to hold on at the end of the one mile five furlong trip. The race is run on behalf of Cancer Research UK and over the past four years, in excess of £840,000 has been raised for the charity at The Festival. It is hoped that the efforts of the 12 jockeys will push the grand total beyond the £1 million mark this year. Laing has a long history with horses and joined the Pony Club as a child before taking up eventing. She is currently competiting in show jumping competitions up to 140 level internationally and trains with top show jumper Tim Stockdale. "That was absolutely amazing!" said the winning jockey. 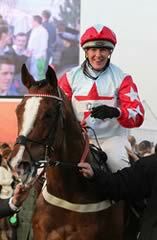 "I'd like to thank Cheltenham Racecourse and Cancer Research UK for giving me such a great opportunity and all the credit has to go to the horse who did his job brilliantly. "I had a bit of a scare on the way to the start as he started to bolt but luckily I managed to get hold of him as well. "I always knew I was a fair way ahead and when I looked round coming down the hill I just thought I was going to get shouted at by Ian (Williams, the trainer) when I got back in. "I'm a complete novice and a complete unknown in the world of racing but to come to the Cheltenham Festival and ride a winner is amazing. "I only knew I was in the race a couple of weeks ago as I was second reserve but I made sure I went to Ian's a couple of times to ride out a few horses and get my eye in. "It's a completely different kettle of fish to eventing and show jumping though. The speed that you go at the one mile five furlong trip is a lot different to the four miles around Burghley and obviously there are no jumps." Channel 4 Racing's Rishi Persad produced a remarkable recovery to stay on his mount, Twelve Strings, as his saddle slipped four furlongs out. The affable presenter eventually finished seventh and admitted that his first experience of riding round Cheltenham hadn't been the best. "I'm fine but it was very frustrating," said Persad. "My saddle started slipping at the top of the hill and I continued to hang on in there. I managed to stay on and push a little bit. "He's a lovely horse to ride and I think he could have finished second if everything had gone right. A big thank you to everyone for their support." Channel 4 Racing presenter Rishi Persad is one of the 12 riders for next year's St Patrick's Derby, held during The Festival at Cheltenham on March 13. The fifth renewal of the charity race, which has raised over £800,000 so far for Cancer Research UK, sees a line-up of jockeys from all walks of life, some of whom currently work in racing and others that have careers outside the sport. The 12 riders are Channel 4 Racing, BBC and Racing UK presenter Rishi Persad; Morgan Stanley banker Kieran Ryan; Development Director at Great British Racing Nigel Roddis; Dubai-based Sheikh Samir Mirdad; Emma Cook who works at Cheltenham Racecourse; Michelle Turner a Director at Pertemps; Point-to-Point enthusiast Heather Kemp; Wexford trainer Bernadette Murphy; assistant trainer to David Bridgwater, Lucy Bridgwater; County Meath businessman Douglas Taylor; student Tom O’Neill and Cheltenham businesswoman Alexia Buckwell. Sophia Brudenell, Communications Manager at Cheltenham Racecourse, commented: “We had a huge number of entries for next year’s St Patrick’s Derby and it was therefore really difficult to pick the 12 chosen riders. “We wanted to ensure that we have a mix of people riding from both the racing industry and those who ride either as a hobby or in another equine sport. People of all ages are participating and both sides of the Irish Sea are well represented. Frances Milner, Director of Supporter Led Fundraising for Cancer Research UK, added: “We are delighted that for the fifth year running Cancer Research UK will have the honour of benefitting from such a special charity flat race at The Festival. “In previous years, we have been astounded by the race’s participants; from their personal motivations for wanting to race, the quality of their riding and of course their fantastic fundraising efforts. The money raised at The Festival will help us bring forward the day when all cancers are cured. 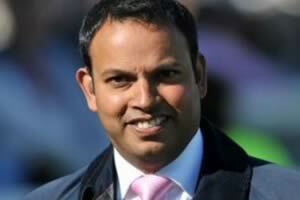 · Rishi Persad, DOB26-05-1973, from Cobham, Surrey. Presenter for Channel 4 Racing, BBC and Racing UK. Due to work/life commitments Rishi has not ridden for many years and is preparing to significantly step up his training in order to take part. Rishi’s wife once rode on the Flat and is ready to dispense some advice on changes he needs to implement. · Kieran Ryan, DOB11/6/1968, from Chiswick, London. Kieran has been riding for about 10 years and has taken part in the Newmarket Town Plate three times. Competing in this race is important to him not only because of his love of Cheltenham but also because his father, who was also very passionate about racing, died about two years ago due to cancer. · Nigel Roddis, DOB19/02/70, from London. Development Director at Great British Racing. To prove how much racing is embedded in Nigel’s life, he secured his first job at a law firm by tipping Imperial Call for the Cheltenham Gold Cup to the managing partner. Living in London means that riding out for Nigel is curtailed to the weekends; however the thought of riding up the hill at Cheltenham has kick started a new fitness regime. Nigel lost his grandfather, father and a close personal friend to cancer and so is very aware of the fantastic work that Cancer Research UK does. · Sheikh Samir Mirdad, DOB28/01/1969, from Saudi Arabia. Advisor to senior Royal Family members in the Gulf Region. The Sheikh rides out as often as he can when in County Louth, Ireland, and Dubai, and the amateur rider has competed in show jumping as well in the Portuguese Sunshine Tour 2013. His grandmother, who raised him, fell victim to cancer as well as his wife who is currently recovering from the illness. He would like to raise as much money and awareness as he can for such a worthy cause. · Emma Cook, DOB28/05/1989, fromTewkesbury, Gloucestershire. Regional Senior Sales Co-Ordinator at Cheltenham Racecourse. Having worked in Cheltenham for a few years, Emma knows the place very well. She has ridden for 10 years and is very keen to make a worthwhile difference to anyone suffering with the disease. · Michelle Turner, DOB07/11/64, from Swindon, Wiltshire. Main Board Director of Pertemps. Michelle has an excellent level of fitness as she exercises three times a week with a personal trainer. Having ridden most of her life, she will be well versed for the race. · Heather Kemp, DOB 21/02/1965, from Towcester, Northamptonshire. Property Manager and Point-to-Point Trainer. Heather has 77 winners point-to-pointing, as well as rides under Rules. Her husband has recently been diagnosed with a serious illness, which has inspired her to raise as much money as possible to support the cause. Bernadette has held an amateur licence for several years and enjoyed win and placed rides both point-to-pointing and under Rules. She is a keen runner and has first-hand experience of the suffering that cancer causes, as her father died in 1999 after a brave battle. Assistant trainer to David Bridgwater. Lucy works at a yard local to Cheltenham, where The Giant Bolster, owned by Simon Hunt and placed in the last two Cheltenham Gold Cups, is trained. Back in 2011, the yard’s head girl, Kelly Walsh, died from cancer and Lucy’s ride in the race will be dedicated to Kelly. · Douglas Taylor, DOB13/10/73, from Kilcloon, County Meath. Douglas’s passion for hunting and show jumping keeps him fit along with regular training. He has been coming to Cheltenham for 23 years with two ambitions: to have a winner at Cheltenham (which he achieved in 2011, with Final Approach winning the Vincent O’Brien Hurdle) and to win the St Patrick’s Derby at The Festival. · Tom O’Neill, DOB16/01/88, from Mallow, County Cork. Inspired by his uncle, Jonjo O’Neill, Cork-based Tom rides out at Jackdaws Castle in the summer and rides out locally in the winter months. He also enjoys hunting and taking part in Show Jumping leagues. Both of Toms’ uncles have battled with cancer. When he first listened to Jonjo talk about the treatment and the pain he had to go through, he thought how amazing it was to see how a human can defeat this terrible illness. He wishes to raise as much money as possible to help the everyday research to defeat cancer. Account Manager and Director of Country to Country Property Group. Alexia has an advanced 3DE, worked with Henrietta Knight on horses including Best Mate and pre-training racehorses for Flat and National Hunt. Alexia was diagnosed with Primary Lymphoedema in her left leg, after the birth of her first child. She would like to raise awareness of the condition to show that having such a condition does not mean that you have to stop doing the activities you enjoy. Previous winners of the St Patrick’s Day Derby include racing TV presenter Lorna Fowler, Orna Madden, Brian Bunyan and silver Olympic medallist Tina Cook in 2012, just prior to her London glory.